Using the example of couchsurfing.org to explore online-to-offline hospitality exchanges in the digital age unifies all contributions. Thus some of the steps online (creating a profile, deciding which information should be added, trust building, writing couch requests) and offline (behavior in an unknown environment, tolerance, adapting to expectations, being a goof host/ guest) and online again (importance of reviews) are analyzed under ethnographic aspects. The underlying question is if all couchsurfers are somehow alike in their way of living, to make the community work and if this anticipated world-citizenship or cosmopolitanism is accessible for everybody. Leaving a Eurocentric perspective behind about what it means to be open-minded and cosmopolitan, the book offers insights into couchsurfing practices in Tunesia, Taiwan, Vietnam and Siberia. The authors are trying to explore how expectations of (mostly) Western guests and local hosts differ and how the latter react if problems occur. In fact there seems to be a conflict between hosts making an effort to adapt to the Western culture and guests looking forward to explore the exotic Other. Tensions can also grow if cultural values exist which somehow contradict the couchsurfing philosophy and practice, e.g. letting strangers into your house, boys and girls sleeping in one room, drinking alcohol, etc. Thus clashes with the family or neighbors are almost unavoidable. There are different techniques used: Case studies, interviews with hosts and guests, taking part in couchsurfing events, following forum discussions or even take actively part in these, questionnaires addressed to members on the homepage, and so on. Most of the authors are couchsurfers themselves and have been hosts and/or guests. Thus they have been inside their own field of research, however remaining an objective distance with the combination with others techniques named above. The book contains some very personal experiences; others are more distant but they are always connected to the theoretical framework and context of the ongoing discussions about cosmopolitanism and hospitality. The references are named at the end of each article. The various experiences as hosts and guests plus nine different writing styles make the book a varied reading. Following the authors’ experiences, the results of their studies are sometimes presented as interested facts nearby; hence it is not like reading an academic paper but fun and informative. Moreover it makes the book accessible for a broader audience and allows an ongoing exchange between academic and current discussions. 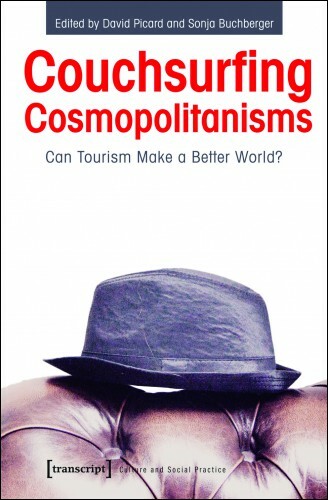 Couchsurfing Cosmopolitanisms opens up your own understanding of hospitality to other cultural perception of being a good guest or host. Who already travelled to the areas named above might have experienced these differences and think in another way about it now. Furthermore the book discusses the question what it really means to be cosmopolitan and if it may still be a westernized term. Jun-E Tan uses the distinction between reflexive and unreflexive cosmopolitanism. Unreflexive cosmopolitanism suggests a consuming way of travelling, regarding couchsurfing using it purely as a service. Reflexive instead means to commit emotionally and ethically and to show authentic interest in order to create subcultural capital. The question which is still open to me is if this subcultural capital is really accessible for everybody or if it relies on certain preconditions like the possibility to travel freely (getting a visa), money, a basis of the same (Western?) cultural values, etc. It is easy to argue that problems only occur when someone is not open-minded enough, but what the authors make clear is that there are underlying ethnographic aspects which can complicate the process. What makes the book most interesting for me is how the community works in terms of trust-building online and offline and the processes which make you a good couchsurfer (profile, reviews, and reciprocity) and thus the community work. After reading the book it was obvious to me more than ever how the couchsurfing philosophy is exploited by other travel services like airbnb. These websites try to establish a community with profiles and reviews in addition to their service to make renting an apartment look more trustworthy and less capitalistic. Therefore I wondered why these services do not play a bigger role in the book, because couchsurfing clearly influenced the conventional way of travelling. Except for this little deficit I would definitely recommend this book to everybody who is interested in couchsurfing in general, cultural interchanges, hospitality and online communities since it offers new insights and raises questions which can be answered personally or in an academic context. Not being a couchsurfer but regarding myself as being cosmopolitan I am looking forward to comments and would be interested in (couchsurfers’) opinions about the book!